Welcome! 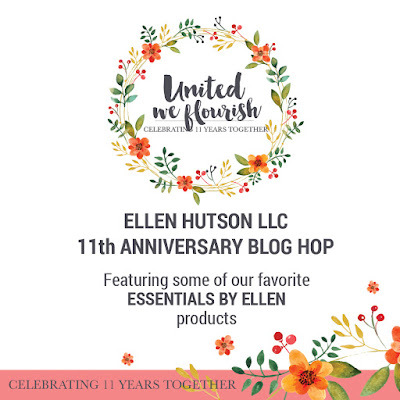 Today, I'm thrilled to be hopping with some very talented ladies in the 2nd Day of Ellen Hutson's 11th Anniversary Blog Hop! It took me forever to come up with this card. Only because when I was asked to participate, I was told to use my favourite Essentials by Ellen products. I completely freaked out! Favourite?! What?! That's like choosing a favourite child!! Haha! I went through all my EBE sets again and again. When I finally settled on Bold Blooms and Bold Blossoms (with some help from Modern Christmas), this seasonal card came together quickly. I love the dreamy quality the soft colours give this card. 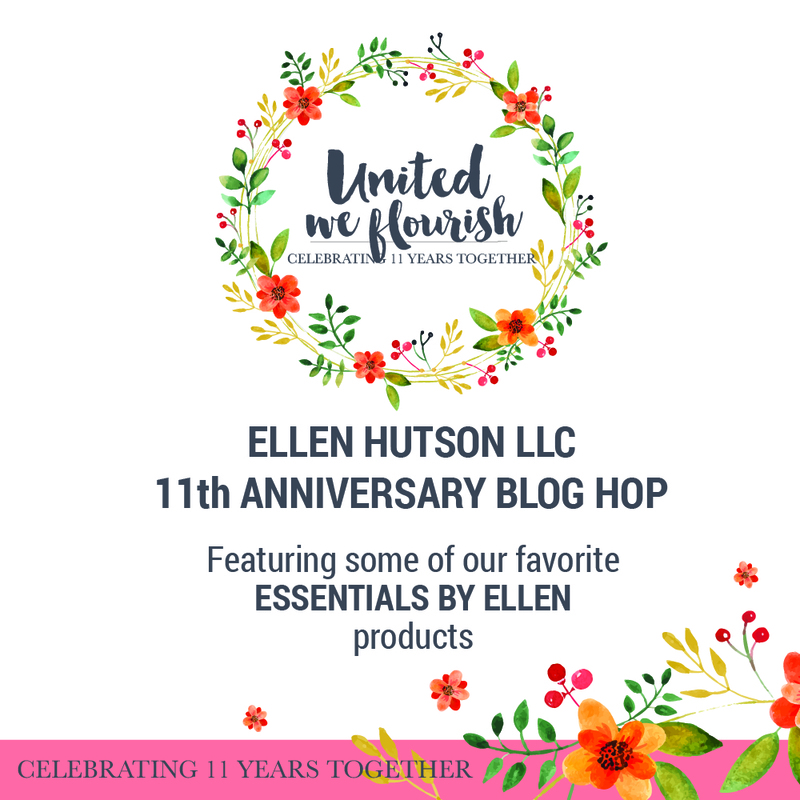 Happy Anniversary, Ellen! I wish you many, many more! PS - there are PRIZES! Check out the CLASSroom for all the details! The next stop on the hop is the fabulous Donna Mikasa! I love this! beautiful colors. How clever - and absolutely gorgeous - your transformation of your favourite set into a poinsettia! As always, marveling at your creativity! LOVE this! Striking card. Love the glitter detail on the edge. Beautiful work. What a cute design using the leaf dies to make a flower! I also really like the subtle color background, the glitter border and that MC font. I just love everything about this card! Color, content, design - it's all fabulous! So pretty, and what a clever use of this "non-Christmas" set. Ardyth your card is gorgeous! LOve the soft, subtle coloring... and so happy to hop with you today! Well you are inspiring some creative uses with several sets. Love the coloring on this too! Beautiful and creative. I never thought of using leaves as flower petals. Some of your designs just make me gasp... this is definitely one of those! Sheer genius. This is my favorite card. So pretty!!! Oh I love the tropical feel of your card! CAS perfection, Ardyth! I really like how you used the leaf die to make flower petals. This is lovely! Have no idea how you picked this favorite, but, oh so, glad you did. Love the ethereal quality you've created. It's lovely. I saw this card on Instagram before I started the blog hop. It is so beautiful. Thanks for your video, too! I always enjoy your clever sense of style. This is a beauty! how creative to use those leaves to make your christmas flower - just lovely! A gorgeous card and a video Ardyth! Love love love! Those dies might be one of my forgotten about favourites too! Love your creativity! How pretty! I love the soft colors, too! Love the inking of the petals, it really makes the flower glow in all its beauty! Wonderful card, loved how you used the leaves and how you colored everything. The leaf die cuts made a great flower. Thanks. Never would have thought to use LEAVES like that! Amazing! Love the colors too! Very clever coloringwith the die - beautiful but simple card! A great reminder to look at your supplies in different ways for unique, one of a kind cards. Thanks for the reminder. A leaf can be a petal! I think it's my favorite too ... still trying to narrow down myself ... also aspire to do videos like you one day ... they are fantastic. Great idea and love the soft colors. So pretty. Saw the video already on IG (btw absolutely love your videos there!) and am amazed that you saw a poinsettia in these leaves! You are so creative and clever! Also love the glitter frame! How cool is that! I just love that you made a flower from a leaf! Amazing! This is gorgeous! I like that it looks different than a typical poinsettia card and kinda modern. Beautiful. Beautiful card. Love the colors you used. Beautiful card! What a clever design! That's a really pretty card!! Love your modern, graphic take on the poinsettia! Very clever and great shading with these colors! I love this card, it's a contemporary take on a traditional flower. Cool card - love the glittery edges. WOW!!!! Love This Beautiful, Colorful, CAS Creative Work of Art! My <3 melted when I laid eyes on this CAS Design! Great Job! Well Done! Oh my!!! Awesome colouring!!! Love your darling card!!! A perfect Christmas card! Love the clever use of leaves & the simplicity of this pretty card. What a strikingly, beautiful modern poinsettia- it's a wonderful card! Great idea. Thank you for the inspiration. Definitely want to steal this idea of making a flower from leaves. I love the colors in this pretty bloom! It feels so fresh and modern! Love the bright pink and green. Thanks for sharing your technique on the video. Lovely card, love the colors. Beautiful ink blending on this pretty card you created. Thank you. I love blog hops b/c they inspire me to create. Thank you to all of the talented artists for sharing their beautiful creations. Awesome use of the leaf die! Love your beautiful card! Your card is wonderful! Love how you die cut and put together all the pieces! Coloring is great as well! Interesting new use of the die. Need to keep my mind open to the different ideas! Really beautiful card. Love the soft colors and the bolder colors in the middle. Great idea to use the leaves for the petals. Very pretty. This is lovely, what a great design and so clever! What a perfect poinsettia. Love the soft colors. Thanks! I love the way you made the poinsettias with a leaf! So clever! Such a pretty card and so simple too. Love it! Great use of the leaf die! So creative. Oh, I love the way you used the bold blossom leaves! Fantastic idea! I will have to remember that! Pretty card! Wonderful Holiday use of non-holiday, and the soft colors are so nice. Peaceful. Such a clever execution- perfect flower. 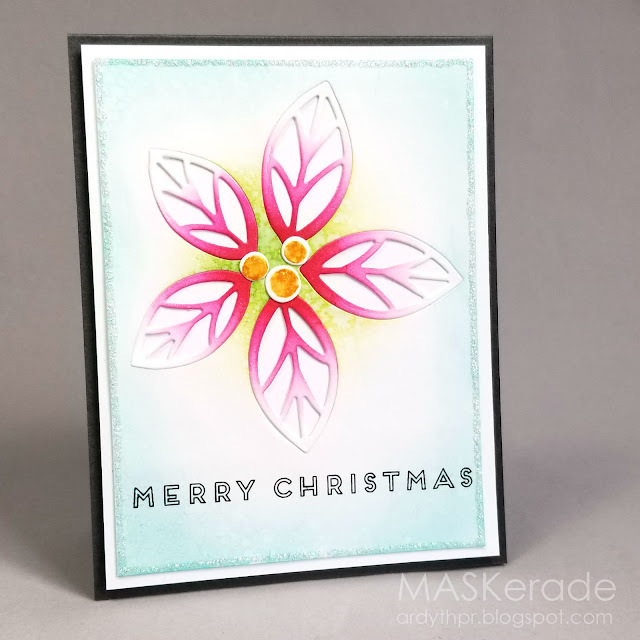 A clever and very pretty poinsettia using this leaf die! Beautifully CAS! Happy Birthday Ellen and Congratulations to the whole team! What a clever idea & the results are great! Gorgeous card - love how you used the leaf die to make the flower. Love the vibrant colors you used! Beautiful and absolutely genius! Thanks for the inspiration! I love the bright modern look. Love this! You are so creative, Ardyth!!! What a great way to use those dies! (I would never have thought of it.) Thanks for the video, showing us how to make your card. Wow !! That's a wonderful card ! I never would have thought of that! Very pretty! Just love the look of this card, Ardyth! You'd think I had seen your card before I made my entry, but actually I didn't. I just love the Bold Blossoms dies, too! Very sweet idea with the die!! Great Christmas look! Very pretty. I like the colors. Love your simple idea to make a very stunning card ! Thanks for sharing ! Well, that's the best card design I've seen all day! Clever! I'm crushing over that gorgeous edge 'frame' and those bright ombre petals!! The ink blending and bright colors are gorgeous! Gorgeous card, love the vibrant colors and awesome ink blending. Such a clever way to use those awesome dies. Love the inlayed leaf flower + Distress Ink! Beautiful! THanks for sharing your technique! Love the way you did this poinsettia, Ardyth. It's a beautiful, simple card! This card is super gorgeous and unique! Thanks for sharing! Love the idea of this card.. and the colors are so bright and cheerful..
What a creative way to make a poinsettia, Ardyth. This is lovely. Seriously love this! You are brilliant! Beautiful and so creative! Love the colors and dimension! Absolutely LOVE this! Awesome use of dies! Bold and beautiful! So unique! Love the way your used the die and the color blending is super beautiful. This is awesome!! I never look at my stamps & dies enough to come up with a different use for them, but I am going to start!! Beautiful card in great colours ! Great use of those dies; thank you for the inspiration. Such a pretty card and I love how you made it. Great job! Very elegant and creative. Loved the video! Such a cute idea for the leaf dies, great card! Great card. I like the gradation of ink on the die cut petals.